Take advantage of recreation opportunities such as a fitness center, or other amenities including complimentary wireless Internet access and concierge services. Additional amenities at this apartment include a television in a common area, complimentary use of a nearby fitness facility, and a reception hall. 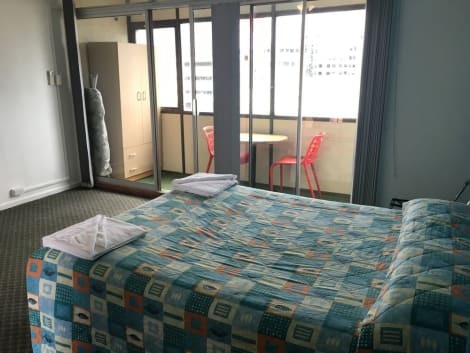 A stay at The Hive Hostel places you in the heart of Perth, within a 10-minute drive of Hay Street Mall and Elizabeth Quay. This hostel is 1.8 mi (2.9 km) from RAC Arena and 2.8 mi (4.5 km) from Optus Stadium. Featured amenities include luggage storage, laundry facilities, and a library. Limited parking is available onsite. 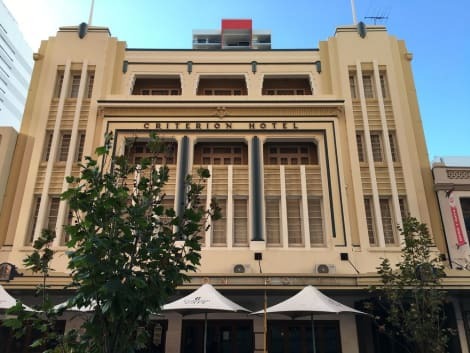 With a stay at Criterion Hotel Perth in Perth (Perth Central Business District), you'll be steps from Hay Street Mall and 15 minutes by foot from Elizabeth Quay. 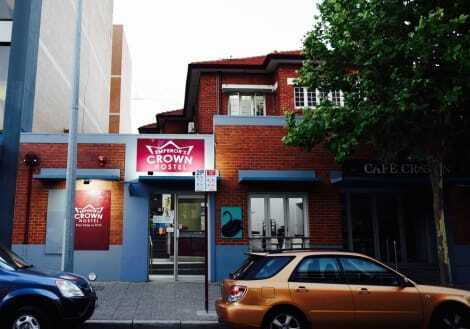 This hotel is 0.4 mi (0.7 km) from Royal Perth Hospital and 2.7 mi (4.3 km) from Crown Perth. 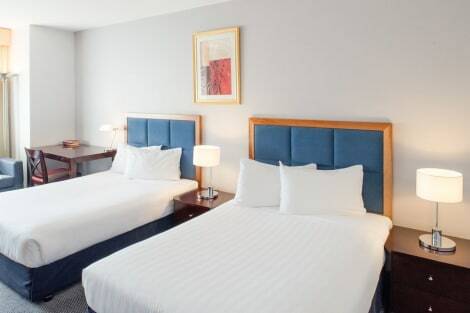 Welcome to Parmelia Hilton Perth Hotel. 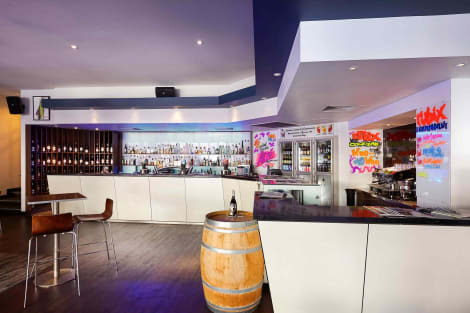 Located in the heart of the central business district and across the road from the Perth Convention Exhibition Centre, this stylish Perth hotel offers comfort and convenience. Discover superb shopping opportunities and a vibrant nightlife, or enjoy a relaxing stroll through Kings Park, all close by.This hotel features a collection of artworks throughout the building. Relax in one of the hotel’s comfortable guest rooms with wireless internet, a 32-inch LCD TV, complimentary cable channels and 24-hour room service. Work out in the hotel’s 24-hour fitness center and enjoy a refreshing swim in the outdoor pool. Catch up on work in the 24-hour business center and relax with a sizzling steak in the Adelphi Grill.Host an event in one of the 10 meeting and event venues, including the elegant Swan Room - perfect for weddings and special occasions.Parmelia Hilton Perth Hotel is proud to give back to the community through partnerships with the Cancer Council of WA, the West Australian Ballet and Big Brothers, Big Sisters (YMCA). Perth is the perfect place to relax and unwind whilst enjoying all the amenities of city life. Known for its pristine, white sandy beaches, it's also a cosmopolitan hub of activity. You'll be spoilt for choice for indoor and outdoor activities to keep you busy in this thriving city which is surrounded by natural beauty. 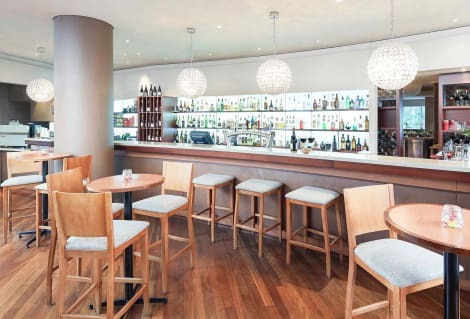 Perth hotels are suiSEOSITE_LEVEL_DESCRIPTION for all travellers, and easily serve all tastes: from cute B & Bs, to high-rise chains in the centre of the city, and some spectacular ocean-view properties, we're sure to have the right place for you. The beaches are the star in this beautiful city where the Aussie outdoor life reigns supreme. All of them are easily reached by public transport. Cottesloe is the best-known and the most popular, and once you get there, you'll realise why: it's a great spot for swimming and walking and has a wonderful atmosphere when the sun's out and the city comes out to enjoy the great outdoors. If you want to get away from it all, Leighton and Mosman beaches make up one of the most peaceful sections of the Perth coastline. Scarborough and Trigg are great if you want to try your hand at surfing, while Port Beach is good for families with its gentle waves and views over nearby Fremantle. The possibilities for a very Australian day at the beach are almost endless in this beautiful and relatively unspoilt part of Australia. If the sun is – uncharacteristically – not shining while you're in Perth, there's plenty to keep you occupied in the city itself. The Shipwreck Galleries are home to a fascinating display of maritime archaeology including a section of the hull of Dutch merchant ship Batavia which was wrecked in 1629, while the Art Gallery of Western Australia contains important collections of indigenous and post-war paintings. The Botanic Garden in King's Park is a real treat even on a cloudy day, with over 2000 Western Australian plant species to discover. In spring you can enjoy the beautiful displays of wildflowers, while the Lotterywest Federation Walkway provides a year-round attraction, leading you through the spectacular tree canopy. If you need to pick up a new bikini for the beach, or want to grab some souvenirs to take home, Perth has shops for every taste. From bustling markets to sophisticated malls, you won't leave empty handed. At Watertown Brand Outlet Centre, you'll find lots of big international and Australia brands, all at knock-down prices. You can stock up on the latest beach fashions, buy unique Aboriginal art, discover unique antiques or find special gifts for your loved ones. Make sure you check out some of the weekend markets in Perth. They're a great place to people-watch and to discover some of Perth's characterful neighbourhoods. Canning Vale: Western Australia's largest undercover market takes place on Sundays, with over 1,000 stalls selling everything you could imagine, from vintage clothes and jewellery to books, toys and even war memorabilia. Australia's foodie culture has gone from strength to strength in recent years, and nowhere is that more evident than in Perth, where the city's multiculturalism is reflected in its food scene. Try delicious gourmet Japanese food at Halu, spicy Indian cuisine at Grill and Chill, or simple, fresh Mediterranean dishes at Zephyr. Seafood is available everywhere, freshly caught in the Indian Ocean. If you're after low-key dining, enjoy great, locally sourced fish and chips on the beach, or simply sip a flat white in one of Perth's many coffee shops.